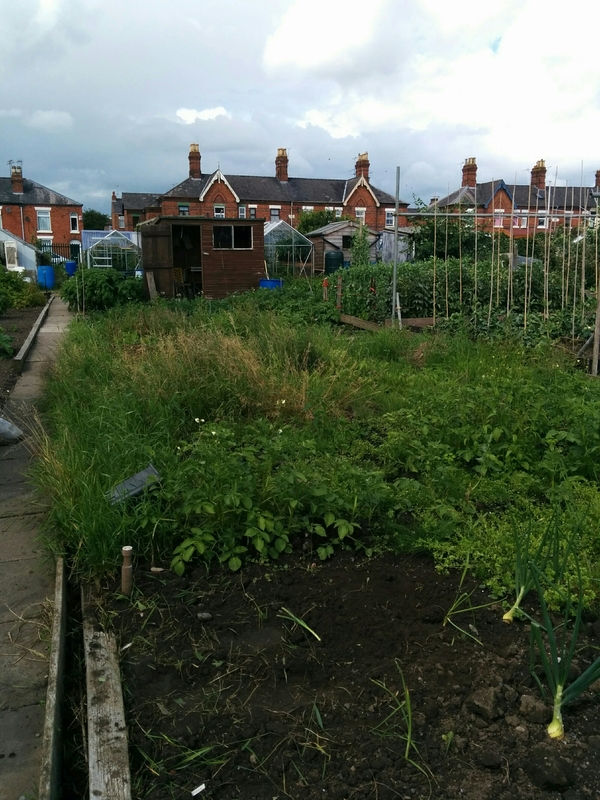 After days of rain and aborted attempts at getting down to the allotment, we finally managed it today! I called Chris the Warden a couple of days ago to officially tell him that we were going to give up the bottom plot. 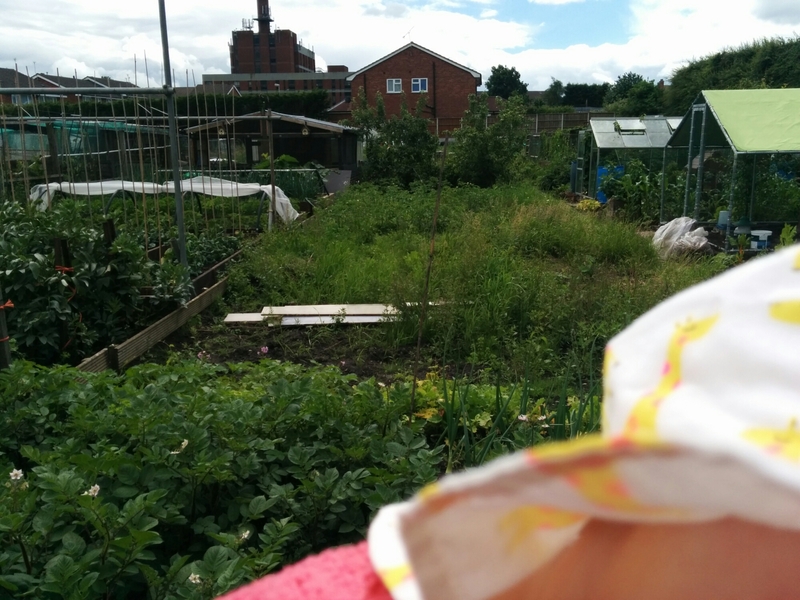 I also bumped into the Allotment Chair Donna in the park after work on Friday and spoke to her – it turns out that several people had been complaining about the weeds on our plots and were egging her on to issue a formal reprimand letter. Luckily she told them where to go and suggested they talk to me about it. No one has. Good to know that having PND and a difficult baby with mild motor development delay doesn’t give you a valid excuse to not have a spotless plot. They say they want more young people on site but how can they expect working people or people with young families to have the time to make their plots as immaculate as those who are retired and can spend all day down there?! Anyway, rant over for the time being…. 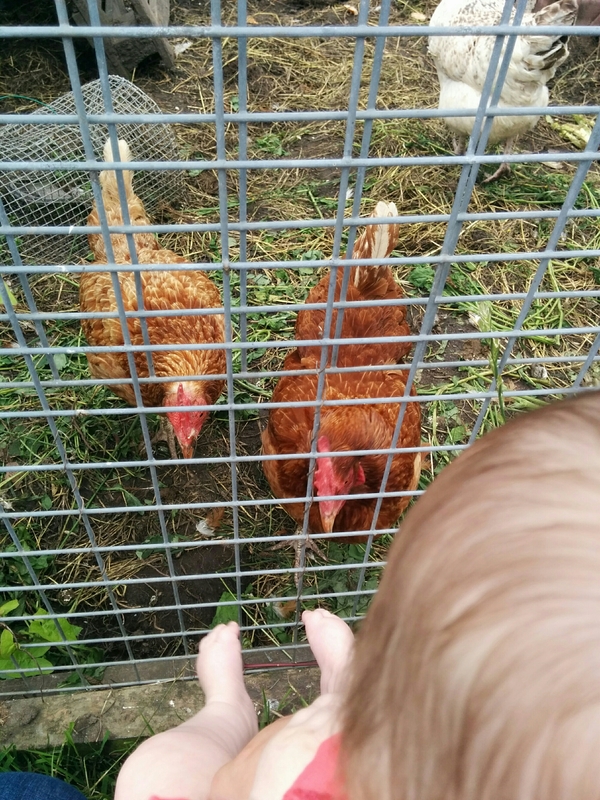 One grumpy and hungry baby was fed by the long suffering husband, while I decimated the weeds growing in front of the fruit trees and between our rows of potatoes. 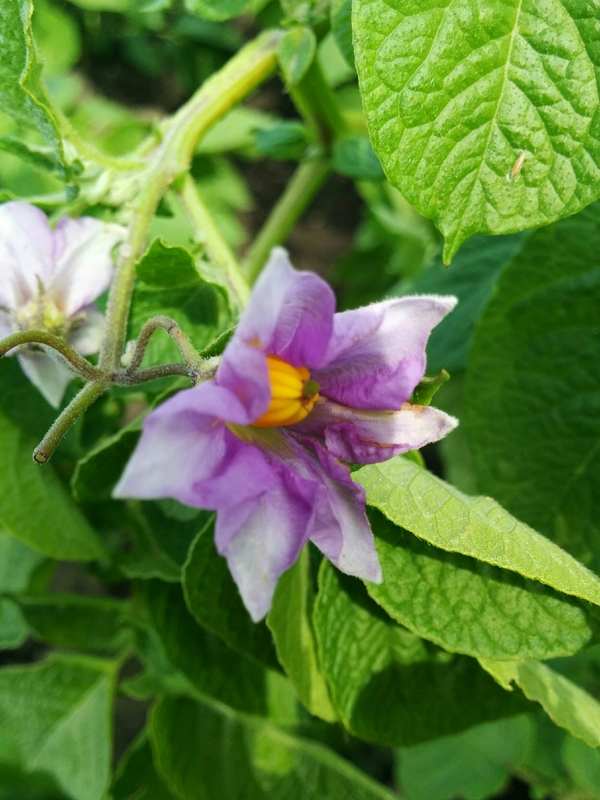 They are starting to flower so hopefully in the next few weeks we will be back to having our own potatoes! 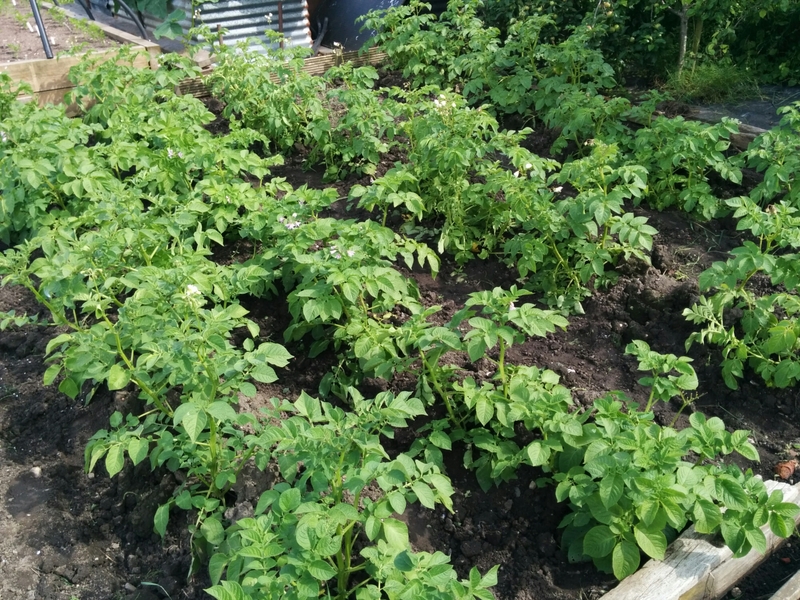 Only once the flowers have died down fully are the potatoes ready for harvesting. We had bacon butties for lunch in between attempting to feed an over-tired baby. The sun came out and we spent half an hour relaxing over lunch and enjoying the nice weather. Then, in true English form, it started to rain. My husband took the baby home and ensconced himself in the sofa accompanied by Wimbledon tennis coverage (replays due to play being rained off). 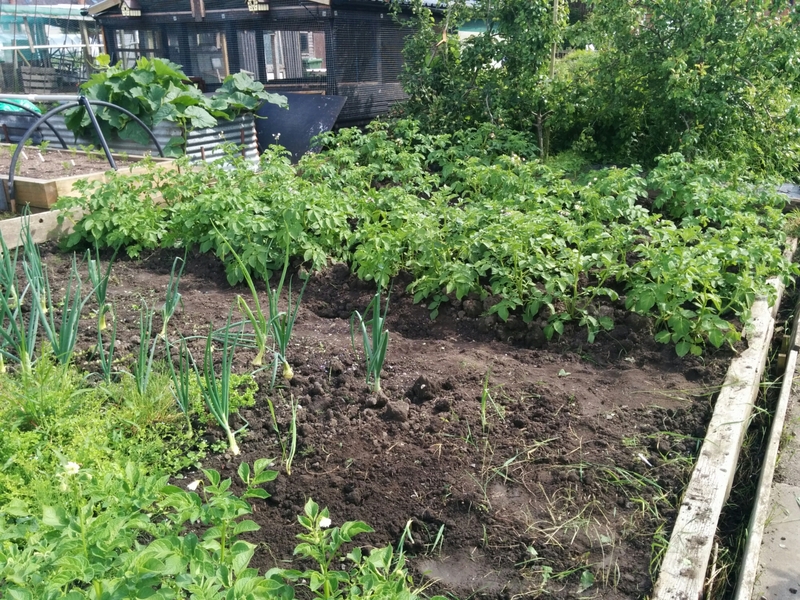 I carried on through the showers and managed to clear the weeds right up to the onion rows. We have left the back of the plot, behind the fruit trees for another day as the rhubarb, gooseberry bushes, raspberry bush and cherry tree need relocating before we can put up the new coop. Geoff is being brilliant as usual and is trying to work out how to fit the nest box her built into or around the new 4m x 4m (13ft sq in old money!) coop. We plan to order it this week ready to move all the chickens into their new home in about two weeks. 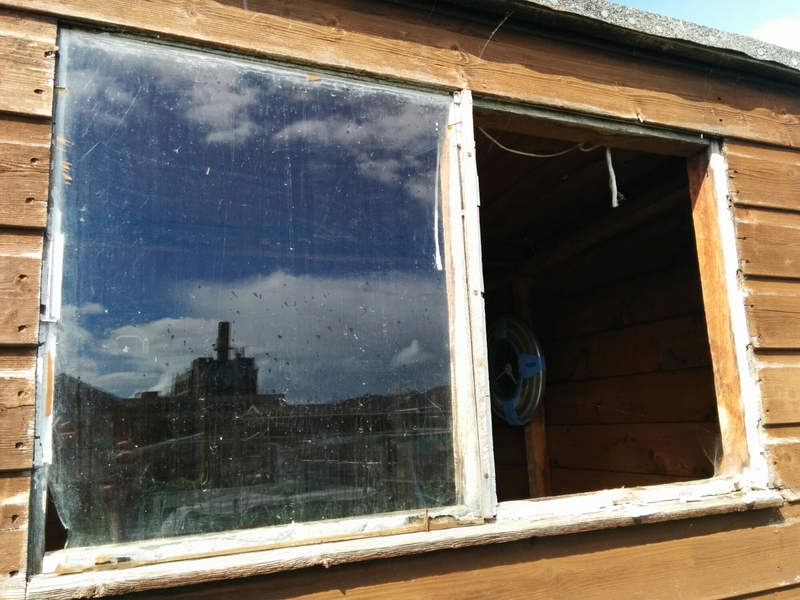 Just as I was leaving, the glass in the shed window smashed. Not sure how to replace this but it will have to wait until tomorrow! We also have to try to clear the bottom plot before reletting. Don’t ask how this will be done. I have absolutely no idea! Planned to take away a few of the fruit bushes to add to our top plot (blueberry, blackberry, redcurrant and a blackcurrant and possibly a few raspberries). I need to find a good patch on the top plot to be out fruit section. 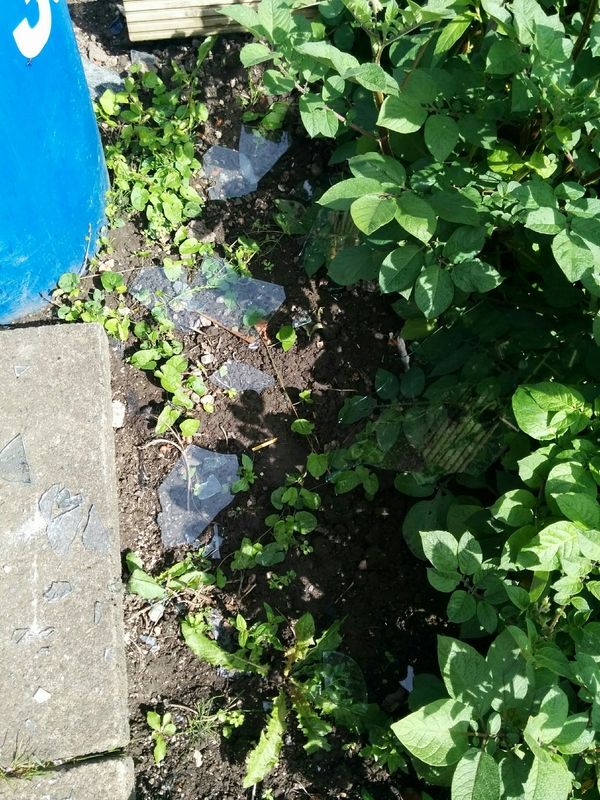 And so tomorrow – if the weather holds off (not looking promising as it is currently pouring outside) – is to continue to weed the top plot and when Fiona is back, paint the shed and clear the greenhouse. Good job! We are finding it hard to keep on top of ours too at the minute, my 2 year old cried as the weeds on the path were as tall as her and she didn’t want to walk through them. Don’t let them get you down. Thanks! Lot more work still to go!